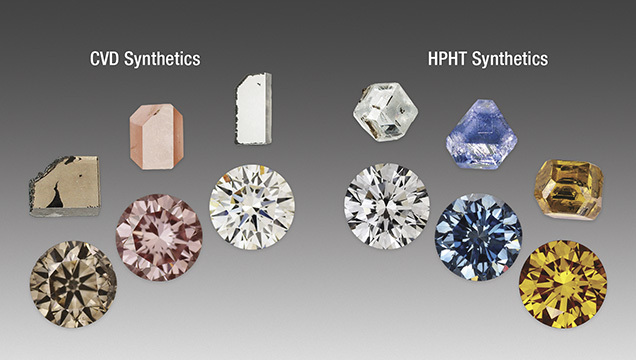 CVD- and HPHT-grown synthetic diamonds occur in a variety of colors depending on the growth conditions and post-growth treatments. While their final faceted appearances may be similar, the crystals produced from the two techniques are usually quite different. In the last few years, the influx of synthetic diamonds into the market has sparked tremendous interest in the laboratory growth of this beautiful and fascinating gemstone. The chart provided here offers a summary and reference guide for the growth parameters and characteristics of both rough and faceted samples grown by the two major methods of synthetic diamond production: high-pressure, high-temperature (HPHT) growth and chemical vapor deposition (CVD) growth. It also provides the major gemological and spectroscopic features used to identify these lab-grown diamonds. The last few years have seen numerous advancements in synthetics: the rapid evolution in CVD technology, the ability to produce 10+ carat HPHT synthetics, and the proliferation of HPHT-grown colorless melee diamonds. 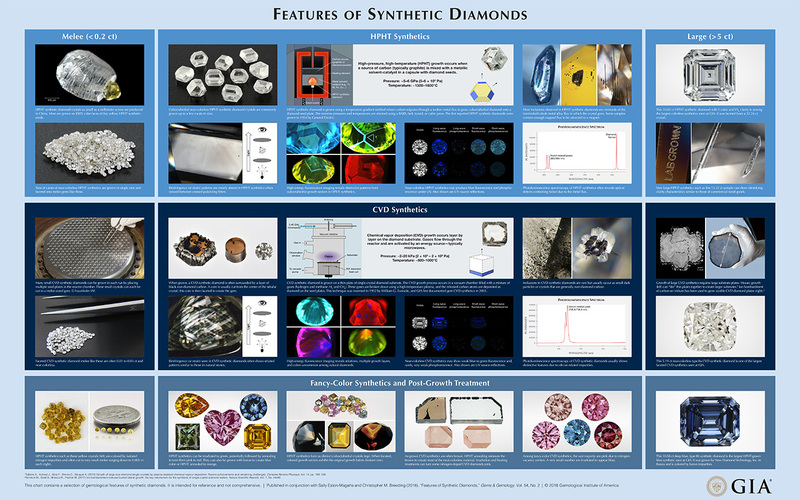 The far left column of the chart focuses on features of melee-sized lab-grown diamonds (those less than 0.2 ct), while the far right column presents photos and photomicrographs of large (greater than 5 ct) faceted synthetics. The top two rows are assigned to HPHT synthetics and linked by the blue background. The third and fourth rows discuss CVD synthetics and are distinguished by the dark blue background. The bottom row concentrates on fancy-color synthetic diamonds, both CVD- and HPHT-grown. Fancy-color synthetics can be either as-grown or have color due to post-growth treatments. The center portion of the chart focuses on growth methods and gemological traits. Important methods of identification include strain observation through crossed polarizers, fluorescence imaging with high-energy UV, and observation of distinctive inclusions. The panels depicting long-wave and short-wave fluorescence and phosphorescence of synthetics show that the phosphorescence response can be quite subtle to not discernible at all. They also demonstrate that the response is more pronounced with short-wave UV than long-wave. For example, the phosphorescence response in HPHT synthetics to short-wave UV can vary from pronounced to undetectable, indicating that this observation is not always reliable for determining synthetic origin. Similarly, the observation of strain through crossed polarizers is often useful to identify HPHT synthetics, as the vast majority do not show birefringence (although at least one exception has been encountered; Summer 2016 Lab Notes, pp. 417–418). This is quite distinct from the strain patterns seen in CVD synthetics and naturals. Although this chart cannot be comprehensive and cover all aspects of HPHT and CVD synthetics, or fully qualify where exceptions exist, we hope it serves as a useful reference for the reader. The chart is intended to be representative of synthetic diamond materials and technology currently encountered in the market and in gemological laboratories. As synthesis technology continues to evolve, it is likely that some features will shift in the coming years. For more information on synthetic diamonds, please see the suggested reading list below. This chart contains a selection of gemological features of synthetic diamonds. It is intended for reference and not comprehensive. Published in conjunction with Sally Eaton-Magaсa and Christopher M. Breeding (2018), “Features of Synthetic Diamonds,” Gems & Gemology, Vol. 54, No. 2, pp. 202–204. Dr. Eaton-Magaña and Dr. Breeding are senior research scientists at GIA in Carlsbad, California. Deljanin B., Alessandri M., Peretti A., Åström M. (2015) NDT breaking the 10 carat barrier: World record faceted and gem-quality synthetic diamonds investigated. Contributions to Gemology, No. 15, pp. 1–7. D’Haenens-Johansson U.F.S., Ardon T., Wang W. (2015) CVD synthetic gem diamonds with high silicon-vacancy concentrations. Conference on New Diamond and Nano Carbons, Shizuoka, Japan, May 2015. This 32” x 20” wall chart contains a selection of gemological features of synthetic diamonds. Examination of 51 colorless to near-colorless synthetic diamonds from all known sources of production confirms that they can be distinguished from similar-appearing natural diamonds on the basis of their gemological properties.